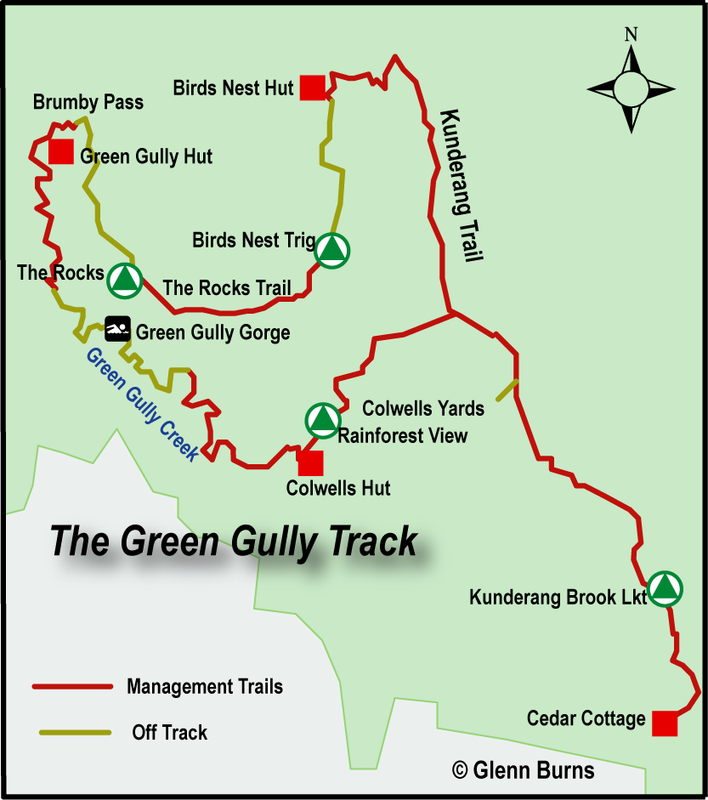 The Green Gully Track is a relatively new 65 kilometre loop walk in the Oxley Wild Rivers National Park in northern NSW. Oxley Wild Rivers takes its name from the explorer John Oxley who passed through this part of NSW in 1802. 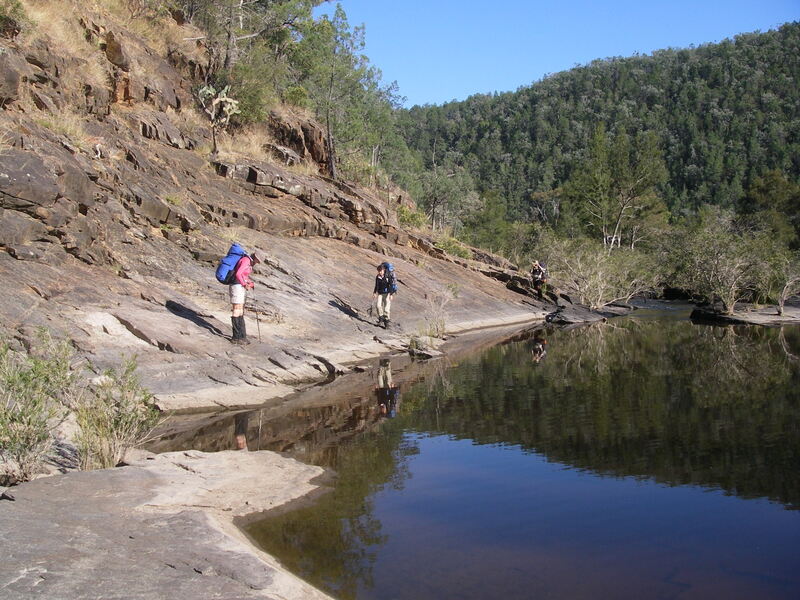 It offers a brilliant four day throughwalk into the remote Green Gully Creek, a tributary of the Apsley River. The walk lies on the eastern fall of the New England Tableland where the rivers have extensively dissected the escarpment creating a tangled wilderness of gorges, waterfalls and rapids. And guess what? 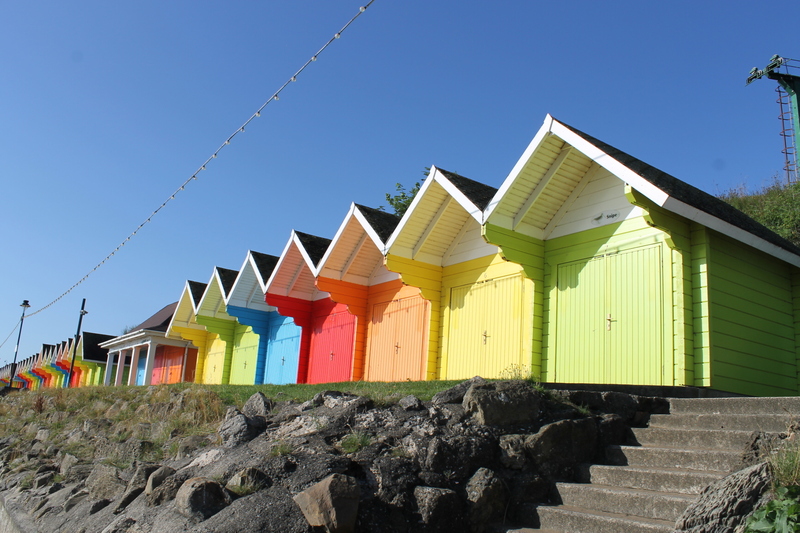 You can leave behind your tents, therma-rests, stoves and other cooking paraphernalia. 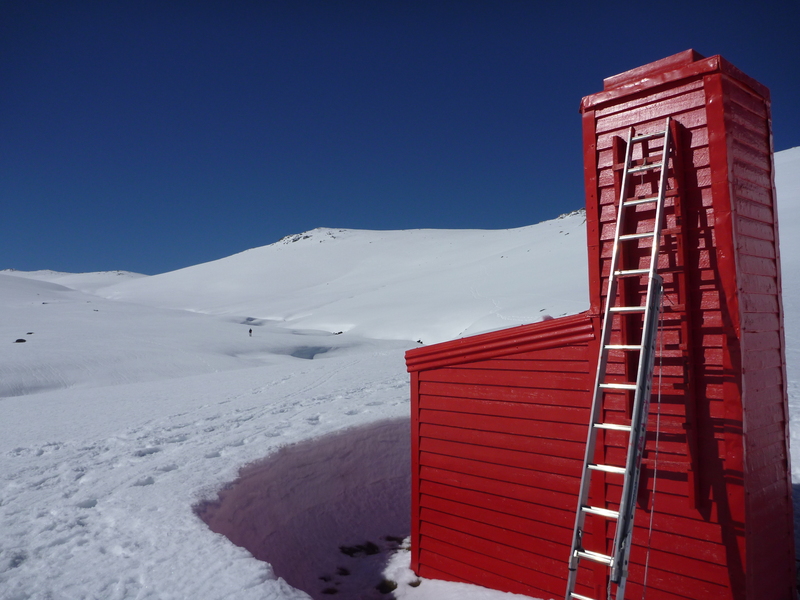 The Parks service has refurbished three cattle mustering huts and lashed out to provide stretchers, comfy mattresses, gas stoves, enamel cooking pots, kettles and basic sets of crockery and cutlery. But before you post off your dosh, a $120 booking fee, it is well to remember that this is a trek with several daunting ups and downs, some off-track sections, rock hopping and numerous creek crossings. 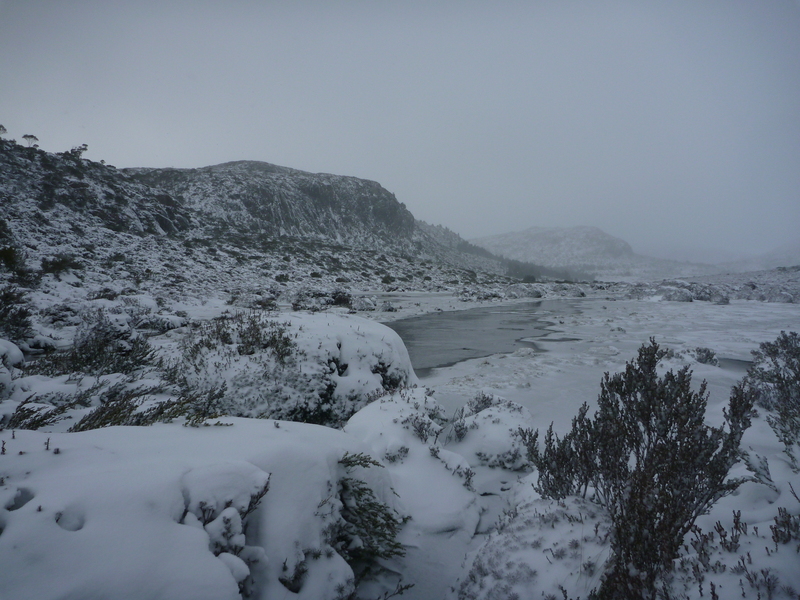 It is described in that excellent publication of the NSW Confederation of Bushwalkers The Bushwalker as “challenging”. It really isn’t all that hard physically and it is well within the capabilities of any fit walker. 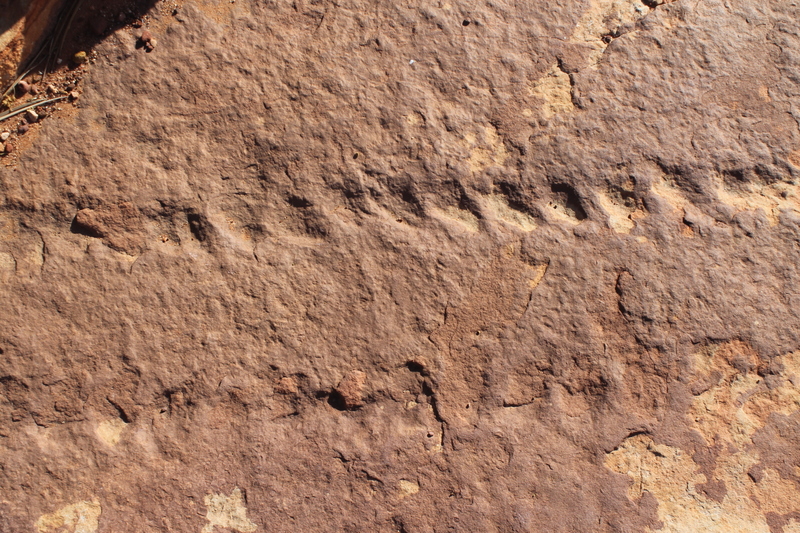 But for those of you interested in Australia’s cultural and natural history, this is definitely a walk for you. Parks NSW is to be congratulated on developing this outstanding walking experience in the World Heritage-listed Oxley Wild Rivers. 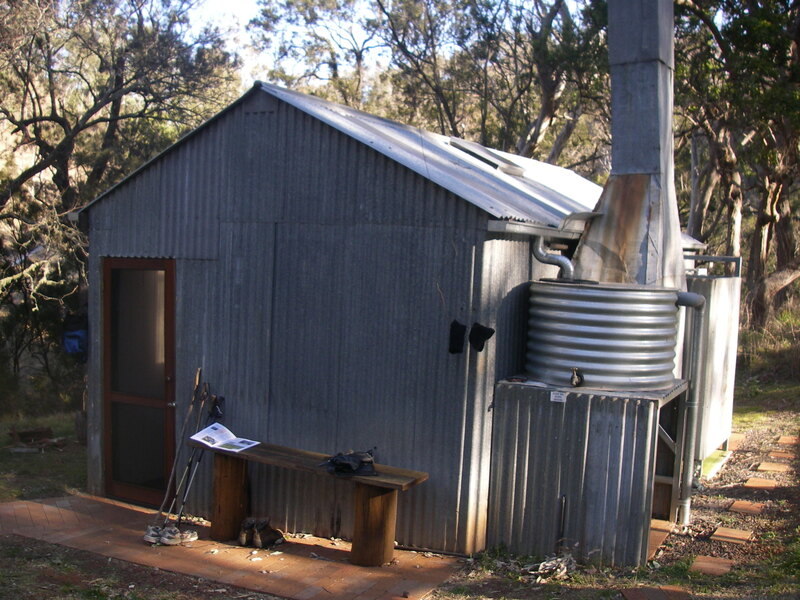 Four crusty old track dogs, Brian Manuel (leader), Don Burgher, Richard Mottershead and this scribe travelled to Cedar Creek Cottage at the start of the track, some two hours from Walcha, and south-east of Armidale in New South Wales. 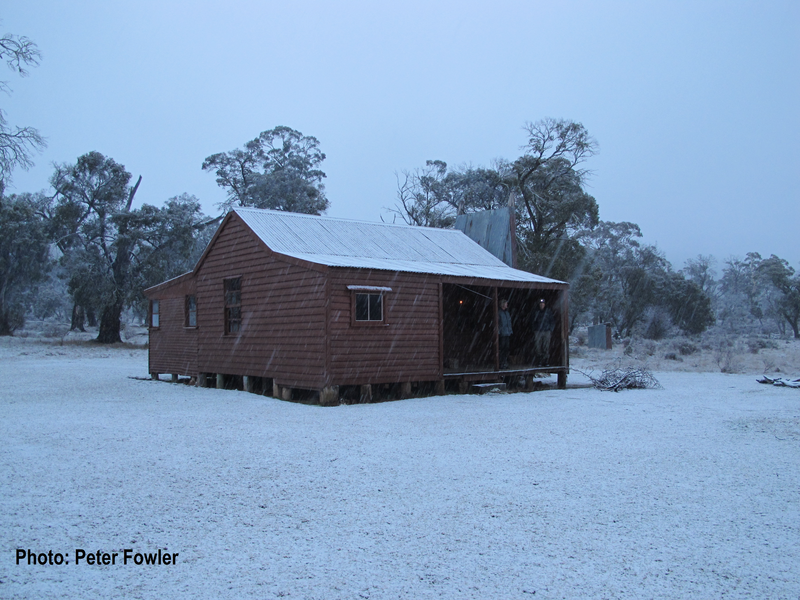 It is recommended that walkers stay at Cedar Cottage overnight to ensure a good night’s sleep before embarking on the first 17.5 kilometre leg to Birds Nest Hut. But this is no hardship. 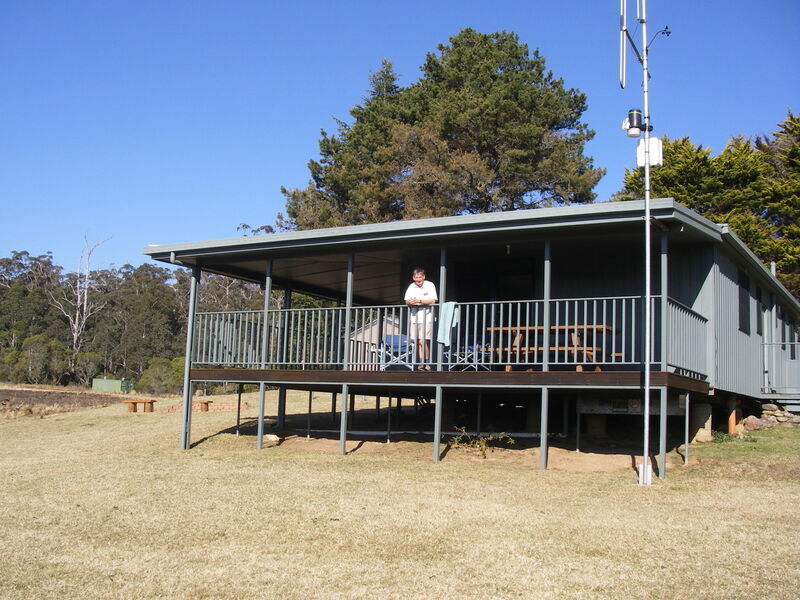 It is five star bushwalkers’ accommodation also serving time as a base for NSW firefighting teams. Cottage is a misnomer as it is, in reality, a very comfortable farm house with all modcons including slow combustion stove, hot showers, bunk beds, flushing toilet, fully equipped kitchen, and a smoke alarm with irritable bowel syndrome. 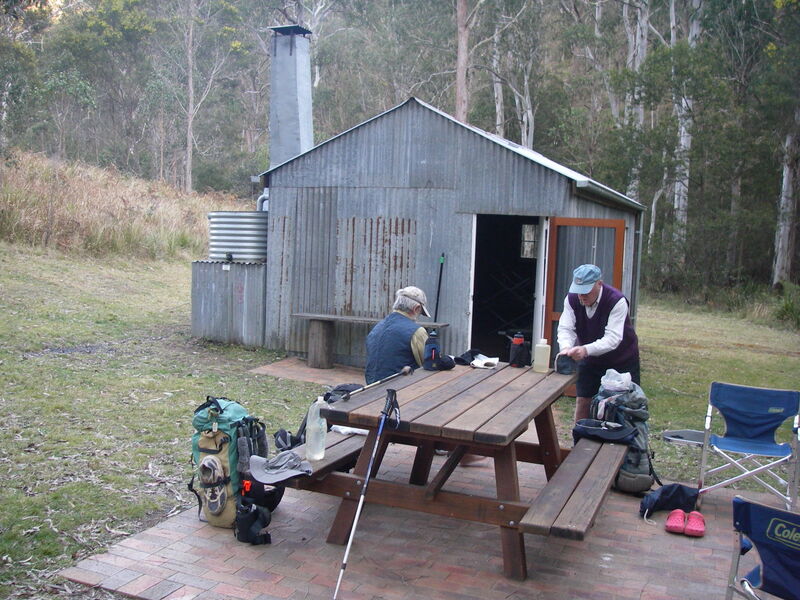 Wednesday 5 September: Cedar Cottage to Birds Nest Hut: 17.5 kms: 6.5 hrs. We creaked out into a brisk – 4°C morning, heading north-west on the Kunderang Trail. This 4WD management track meanders up and down along a 1000 metre ridge which forms the drainage divide between Kunderang Brook and Birds Nest Creek, reaching 1100 metres at its highest point for the day. Kunderang is an aboriginal name, a clan group of the Thungutti who still maintained a close connection with their land even as recently as the early 1900s, working as stockmen and domestics on nearby properities. It is said that the Green Gully area still has evidence of aboriginal occupation: stone tools, flakes, blades, scarred trees and evidence of occupation in a cave in the nearby Kunderang Valley. Our first stop was Kunderang Lookout, sporting an excellent information board, the first of many. 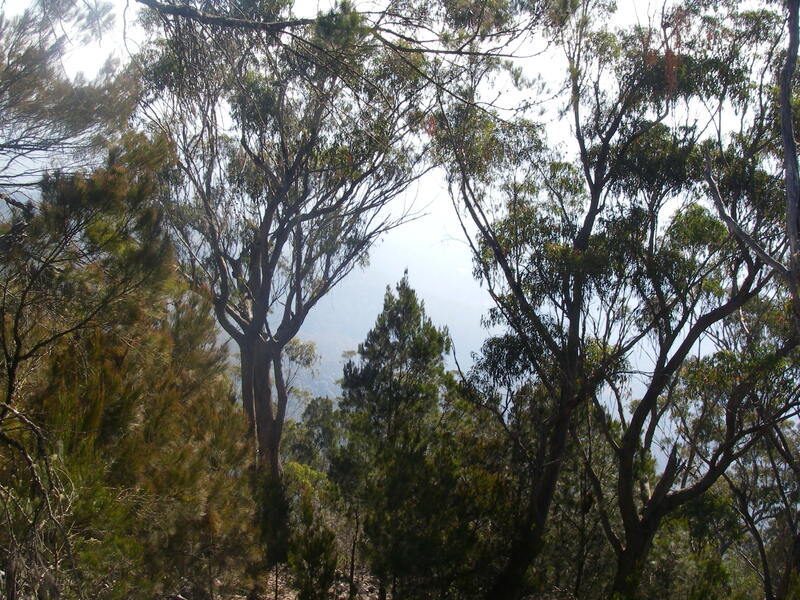 We peered down into the valley of Kunderang Brook, but it was now wreathed in dense smoke haze from bushfires pushed along by north-westerly winds gusting up to 70km/h. But this was a fleeting cause for concern compared with the sighting of our first snake, a sleek track-side tiger snake which seemed in no hurry to wriggle off into the undergrowth. Mid afternoon we dropped into Brumby Creek, a tributary of Green Gully Creek and site of Birds Nest Hut at about 900 metres. This was the first of three mustering huts and their extra heavy duty cattle yards. They are an integral part of the story of cattle grazing in these remote and rugged ranges and gorges. Birds Nest Hut was but one of a system of huts and yards built by the O’Keefe family in the 1950’s to manage their 12500 hectare cattle property, Green Gully. It became part of the Oxley Rivers National Park in 2004, ending another era, that of the cattle stockmen. That is why it is so pleasing to find that the Parks service has maintained the stockyards, fences and huts as a tribute to these hardworking people. And so to relax on our stretchers and mattresses lulled to sleep by the croaking of the endangered Barred Stuttering Frogs in nearby Brumby Creek. 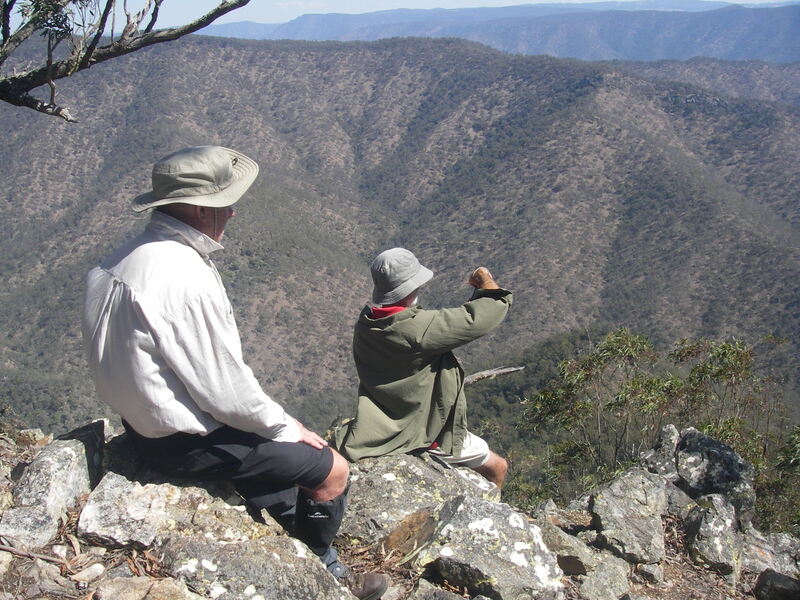 Thursday 6 September: Birds Nest to Green Gully Hut via Birds Nest Trig: 15 kms: 7.5 hrs. We woke to a coolish 6°C morning, the wind chill from gusty north-westerlies driving the temperature down even further. The first leg of today’s walk is off-track, climbing up a three kilometre ridgeline to 1202 metres, an altitude gain of about 300 metres over one and a quarter hours. An easy enough walk navigationally and physically. Birds Nest Trig was the highest point on our walk and is, in fact, the highest point in the entire Apsley-Macleay system. From here we linked onto The Rocks Trail, a groomed management track. This is a superb walk downhill through Eucalypt forest with a verdant understorey of shrubs and ferns. Here we found a number of large owl pellets, possibly from the Powerful Owl according to my Scats and Tracks book. The trail brought us to The Rocks Lookout, our lunch stop. An opportunity to peer down into Green Gully Canyon some 400 metres below as well providing us with good views of the isolated outcrop of The Rocks at 900 metres and Tooth Rocks (700 metres) across Green Gully Valley. Our post prandial leg was one of the hardest of the walk: a 500 metre altitude loss down a long steep ridge line to Brumby Pass and Green Gully Hut. Jelly legs stuff. Perversely, conditions on the open woodland ridgeline were surprisingly hot, despite the wind idling along at 40km/h. But our reward at the end of a hard day was a hot shower, a very comfortable hut and another evening relaxing in front of a blazing log fire. And here was the chance to pick over the obligate knick-knackery that always seems to infest these huts: rusty horseshoes, a drum of Morrison’s Neatsfoot Oil, assorted grimy billies and faded agricultural calendars illustrated with rural scenes or decorous ladies dressed in the matronly styles of the 1960s and 1970s. 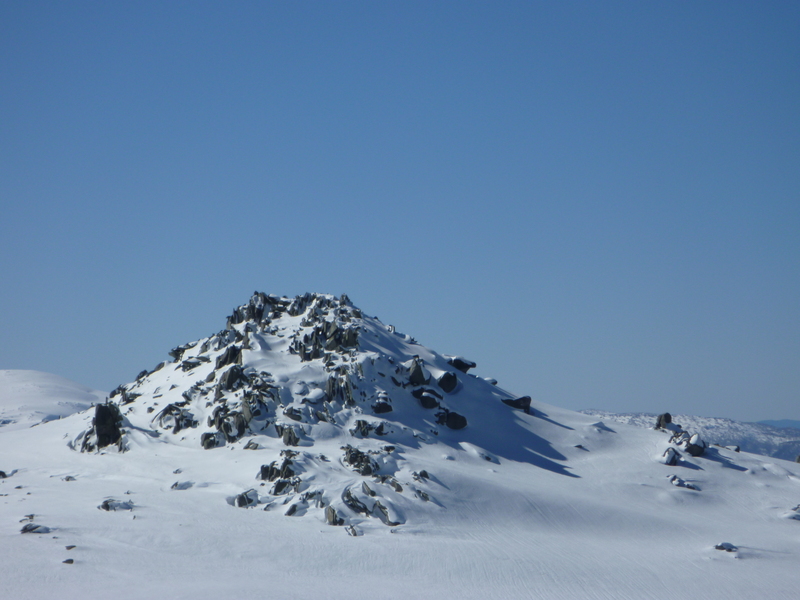 Friday 7 September: Green Gully Hut to Colwells Hut: 13.5 kms: 8.0 hrs. Overnight the gusting wind had not relented but other things had changed. It was time to swap boots for volleys or track shoes and take to the freezing water. One entry in a hut log book whined on about frost forming on walkers’ legs as they waded upstream. Today’s ‘walk’ up Green Gully Creek involved kilometres of rock hopping, inspecting huge boulders of red jasper, wading through a gorge, 41 creek crossings and dodging five more snakes, several being of the best -avoided large red-bellied black kind. And one aggro little sod intent on trying to sink its fangs in, chased me across the rocks. In my hurry to back-pedal away I fell over. Fortunately my rucksack cushioned the fall. Not a good place for an injury or snake bite. But our best sightings were Brush-tailed Rock Wallabies (Petrogale penicillata). This furry fellow with a paintbrush style tail was once abundant in the mountainous parts of Australia but is now an endangered species. Seventy five percent of the remaining colonies of Brush-tails are right here in northern NSW. 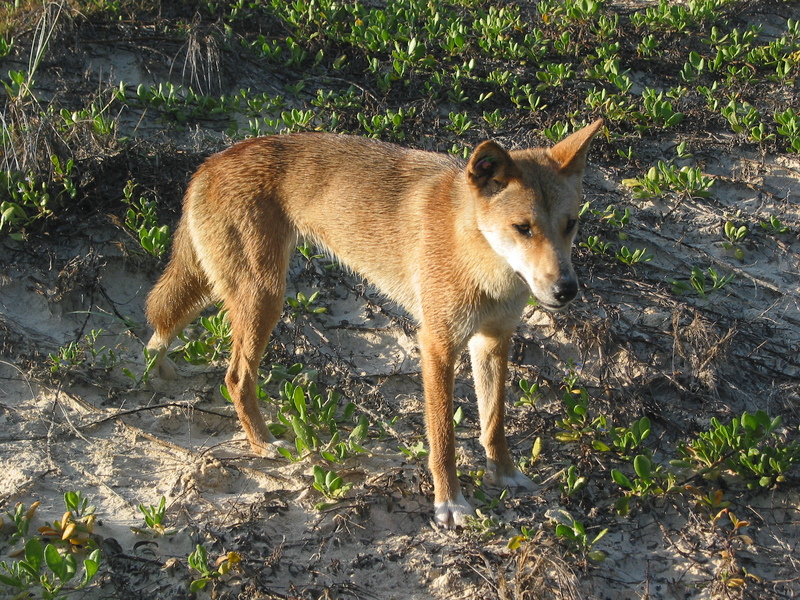 For more info on our furry friends chase up an article by Inger vandyke: Securing the Shadow Wildlife Australia. Autumn 2009 Vol 46 No 1. And so to Colwells Hut. A smallish mustering hut. Realistically accommodating only four adults. If you swing by with five or six, then park the excess under the open-sided shelter. There wasn’t enough room for Don to swing Richard’s much doted on cat in this hut and sleeping outside was definitely not a good option on the night we stayed there; it was still very windy with rain threatening. We were driven inside soon after four o’clock by the cool wind but the rain was a total fizzer, a few spits. 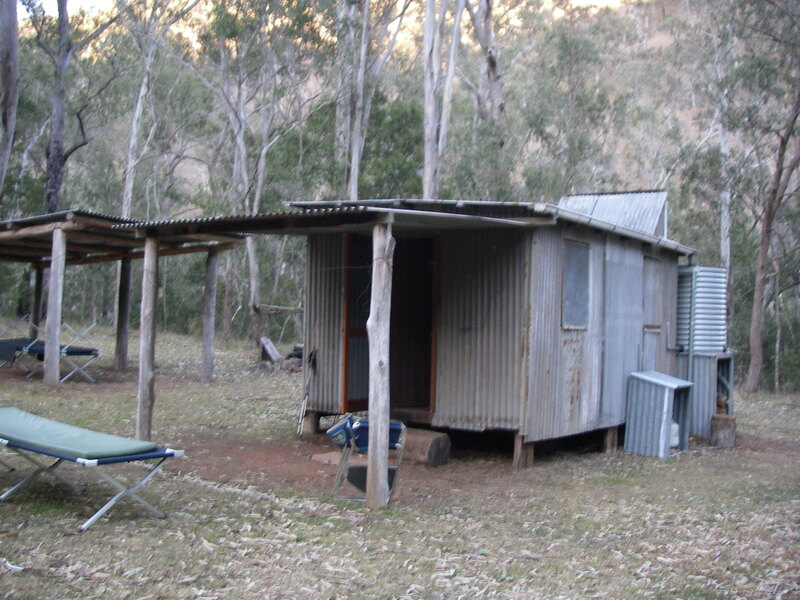 This was the last of the mustering huts built in The Oxley Wild Rivers, constructed in 1994 by Ian and Nev Colwell to replace Alan Youdale’s 1950s post and bark humpy. Saturday 8 September: Colwells to Cedar Cottage: 17.5 kms: 7.5 hrs. Our final day on the track. With a 700 metre climb out of Green Gully this is said to be the most challenging part of the walk. But it is on a 4WD management trail and with light packs it is not too arduous for walkers who have retained some functionality of their knees and ankles. From high up on a 900 metre ridge we looked down into one of the patches of dry rainforest, remnant communities that have species from the great Gondwanan continent. 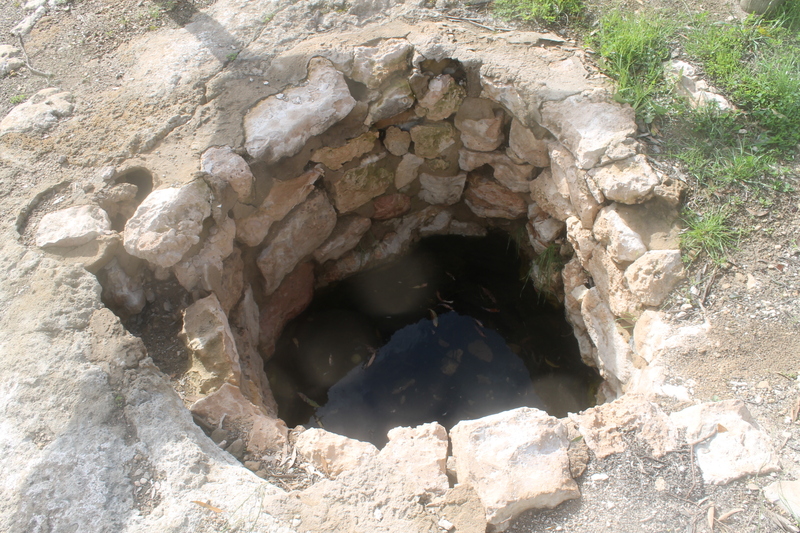 These have survived in cool inaccessible gullies, protected from the ravages of heat and fire. Soon we regained the Kunderang Management Trail and set sail for our final berth at Cedar Cottage. And thus came to an end a most satisfying throughwalk: rambling along through wild high country forests, with spectacular views, remote gorges, Brush-tailed Rock Wallabies and a landscape steeped in the history of cattle grazing. Cauldwell, Dave: Green Gully: Gorge Raiders. Wild 124. Green Gully Track Notes. Wild 132. Inger vandyke: Securing the Shadow. Wildlife Aust. Autumn 2009. Vol 46 No 1. 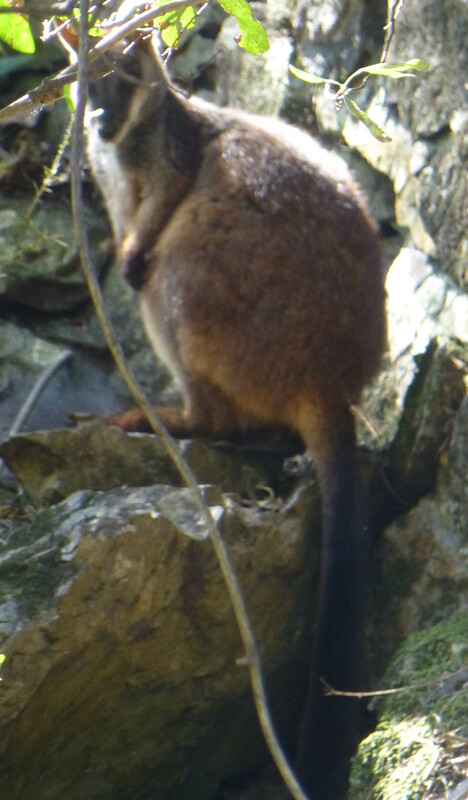 This is an article about the Brush-tailed rock wallaby.